This is the first ARM mbed™ board tested and verified by Microsoft Azure Certified for Internet of Things (IoT) to support the Microsoft Azure IoT Suite. 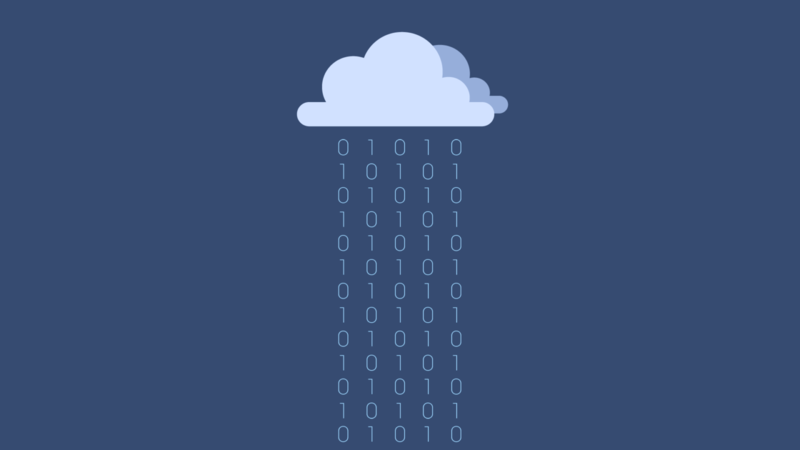 Microsoft Azure is an open, flexible and trusted cloud platform used by the majority of Fortune 500 companies. Developers using the ARM Cortex®-M4 based FRDM-K64F board will have access and guided instructions to the Microsoft Azure IoT Suite software development kits (SDK) published on Github. The libraries have been tested on the board. 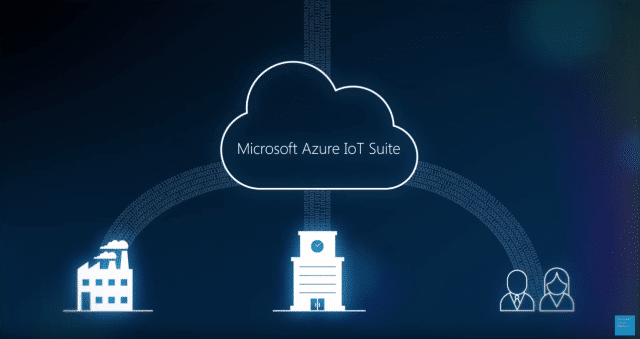 They can be used with mbed applications through the mbed developer website to enable direct connectivity with Azure IoT Suite. The Freescale Freedom development platform is a set of software and hardware tools for evaluation and development. It is ideal for rapid prototyping of microcontroller-based applications for creating IoT products. 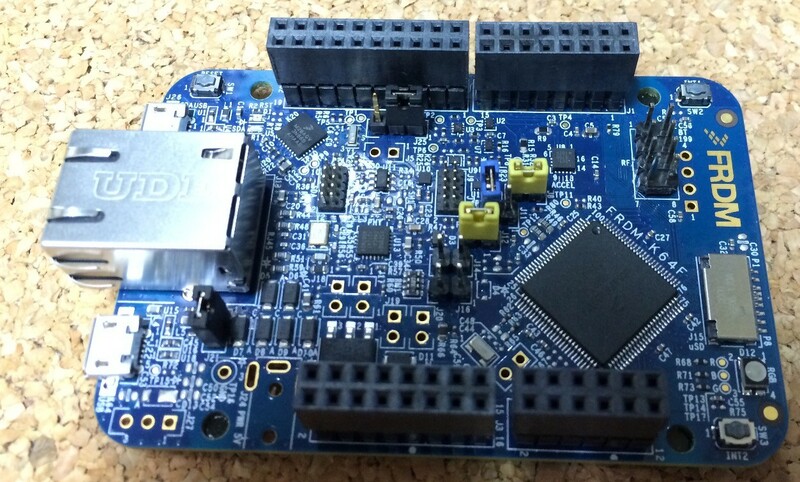 This board features a Kinetis K series microcontroller built on the ARM®Cortex®-M4 core. FRDM-K64F can be used to evaluate the K64, K63 and K24 Kinetis K series devices. The snapshot below is a feature overview of the FRDM-K64F hardware. The FRDM-K64F hardware is form-factor compatible with the Arduino™ R3 pin layout, providing a broad range of expansion board options. It is feature packed with a lot of peripherals to enable rapid prototyping including a 3-axis digital accelerometer and magnetometer to create full eCompass capabilities. A tri-colored light emitting diode (LED) and two user push-buttons are incorporated for direct interaction and feedback. An expansion memory with a microSD card slot is available. 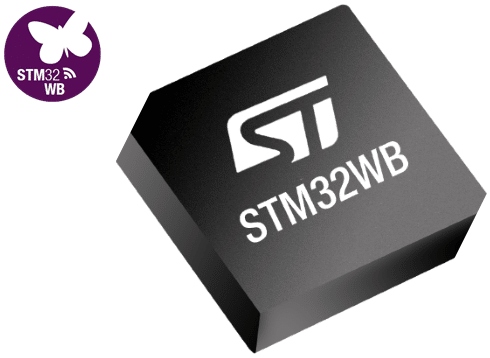 For connectivity, a user can choose the on-board Ethernet port and headers for use with Bluetooth and 2.4 GHz radio add-on modules. 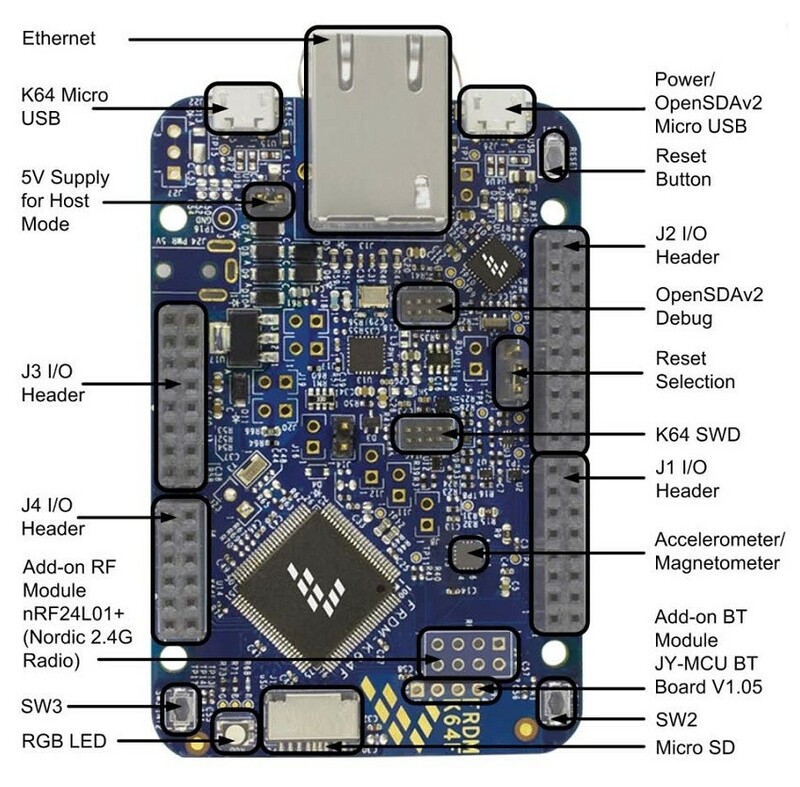 This platform also features OpenSDAv2, the Freescale open source hardware embedded serial and debug adapter running an open source bootloader. This circuit offers several options for serial communication, flash programming and run-control debugging.